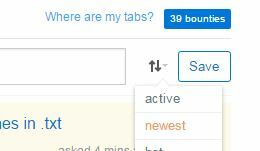 Since, the new tab system has been put in place, I've not been able to get the 'new question' notification when I select the 'newest' filter. I have to always refresh to get the newest questions. Check the screenshot 1 (before refresh) and screenshot 2 (after refresh). Where am I going wrong? Or is this a bug? I've not added the bug tag to question yet, as I'm not really sure about it. It looks like the or confuses it a great deal; however, if you omit the or, and simply change the mode to "any" (rather than "all"), it works; here's a working link that subscribes to realtime for all the tags. Why does the “new” > “recommended” tab give always 96 questions?